The operations departments will make internal operations more efficient. 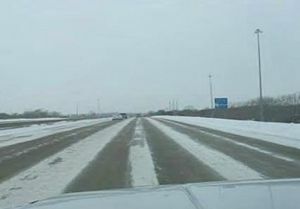 MoDOT has a new direction in five major areas of work including snow removal, striping, signing, mowing and pavement maintenance. 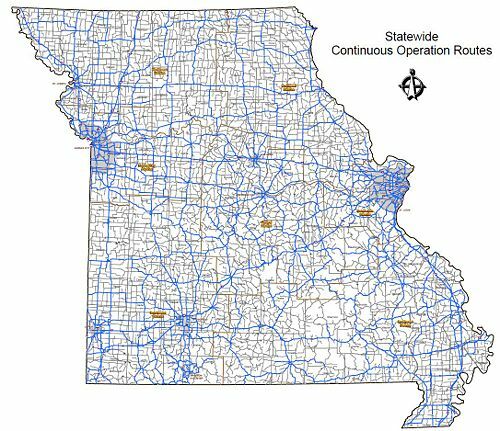 All savings from these operational changes will be used to preserve MoDOT’s high customer satisfaction by keeping our major roads in good condition by producing more quality work on pavements, improving minor roads and maintaining bridges so their conditions don’t get worse. “Continuous Operations” definition has been revised by reprioritizing the roads for regional significance. A route needs to be a major route or have an AADT of at least 2500 to receive treatment as a “Continuous Operations Route”, as shown in the map to the right. 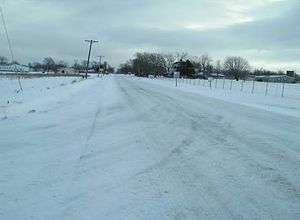 Continuous operations will be performed until roads are mostly clear. Crews will return next working day and continue fight where progress can be made. 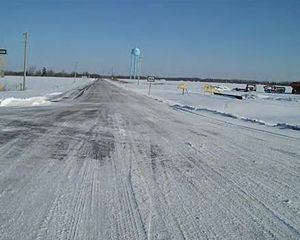 Emergency crews are to be ready to handle overnight refreeze/slick spots. "Non-Continuous Operations Routes” (typically, low volume minor routes), will be plowed open to two-way traffic. Hills, curves and intersections will be treated as needed. 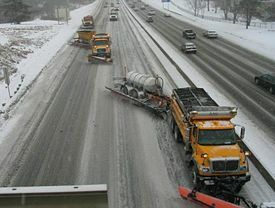 The truck fleet will be reduced over three years and the use of salt will also be reduced. 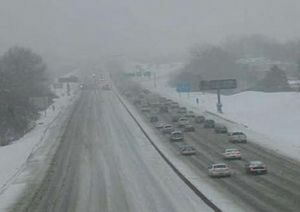 MoDOT will continue to plow snow and treat roads and focus efforts on making roads safe and passable. Practical Operations will efficiently attack each storm by providing statewide consistency. until conditions are mostly clear. 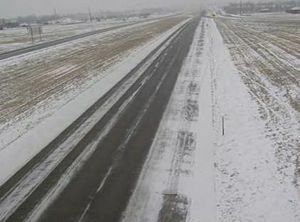 Overnight, emergency crews will monitor for slick spots. 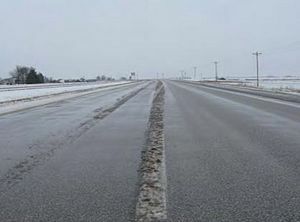 The following day in normal business hours, crews will work on road conditions on these roads and lower priority roads. 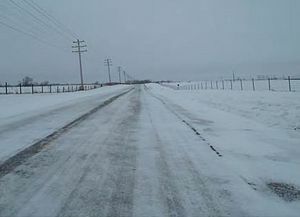 Loose snow will be plowed to two-way passable traffic. MoDOT will minimize unnecessary sign replacement by only replacing signs that have reached the end of their service life using nighttime sign inspections to determine the failure point. MoDOT will use the minimum size signpost necessary to support the sign and will reuse structural posts and bases when possible. Also, MoDOT will design new signs to fit existing bases and posts, where possible. Larger aerial trucks used for sign installations will be made available for state wide use. The Sign Management System will be used to manage sign inventories and the ordering processes. 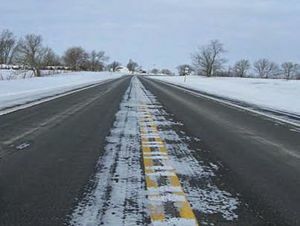 Every major road and every “regionally significant” route will be striped annually unless retroreflectivity performance of the lines meet or exceed minimum requirements. One-half of the remaining minor roads with AADT ≥ 400 will be striped each year. One-third of the minor roads with AADT < 400 will also be striped each year. Strategies, such as night time striping or multiple crews per striper, will be used to complete the program with the available striper fleet that will be downsized. All major routes will be mowed by MoDOT crews prior to Memorial Day and mid-July. Crews will mow the first 15 ft. from the edge of the pavement and medians that are narrower than 60 ft. Correctly mowed 30 ft. wide on a major road. The 15 ft. wide mowing path will allow good sight distance for drivers, which is important for safety. Minor roads will be mowed during the growing season as needed to keep the nearest strip to the edge of pavement at 12 inches in urban areas and 18 inches in rural areas. MoDOT will also use plant growth regulators to keep the overall height of grass down and address weeds on minor roads and around safety devices. All major roads will have a final fall mowing up to 30 ft. wide. Minor roads will have a final fall mowing up to 30 ft. wide in odd years and up to 15 ft. wide in even years. 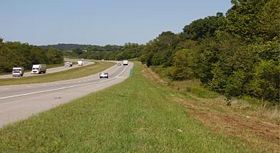 MoDOT is also reducing contract mowing except for areas where specialty equipment is required due to steep slopes or other unique circumstances. See EPG 144.5 for pavement maintenance guidance. Articles in "144 Practical Operations"
This page was last modified on 17 March 2016, at 13:08.